To make the syrup, melt the sugar in water over low fire until sugar dissolves . Set aside to cool. 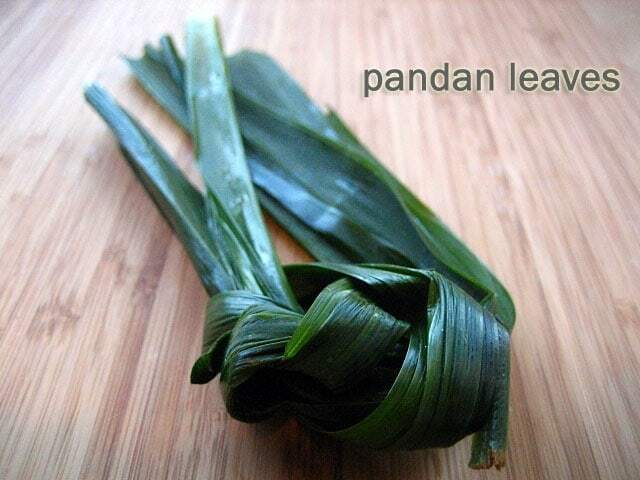 Cut pandan leaves into small peices. Combine pandan leaves and water in an electric blender. Blend for 1-2 minutes. Strain the pandan juice through a fine sieve. Add alkaline water into pandan juice. Set aside. In another bowl, add rice flour and tapioca flour. Slowly pour in the pandan juice mixture while stirring it consistently till well blended. Add in syrup. Cook flour mixture on low fire till slightly thickened. Remove from fire and pour into little teacups.Steam on high fire for 15 minutes. Take the kuih out immediately. Leave to cool for at least 6 hrs before removing the kuih from the little teacups. Serve with fresh grated coconut.